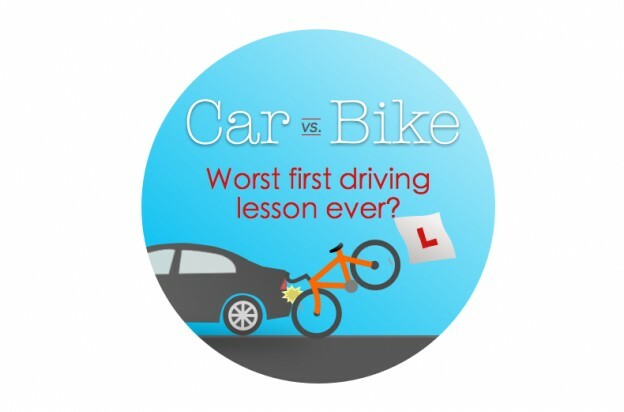 On your first ever driving lesson the thought of hitting anything is always going to be haunting the back of your mind, but Edward Barlow from Liverpool could never have guessed what would be in store during his first lesson when a cyclist rode straight into the back of his instructor’s car while Ed was parked. We caught up with Ed to find out the full story behind the video that has now been seen by millions and has featured on a plethora of international news websites. Hi Ed, tell us about your first ever driving lesson. I was obviously very nervous as anyone would be on their first driving lesson, this was the first time I’d really driven a car at all. It all started off well, we were driving around the Sefton Park area, where it’s quite quiet with only a few cars and, well, cyclists, but I’ll get back to that in a second! After a while he asked me to pull into the side of the road to park, so i pulled over, put the brakes on and left the car running. My instructor told me I was handling the car well and not swerving like many people do on their first lesson, when suddenly there was this BANG! A cyclist had crashed into the parked car. He immediately went out and made sure he was okay, while I was sort of in shock. I mean, it was my first driving lesson, I thought I best just stay in the car! I didn’t know the rules, if I got out the car was I leaving a running vehicle unattended? The cyclist then got back up and cycled off, he was okay but for a small cut and his bike was fine. What was it like to watch it back? My instructor got out his iPad, which is connected to the dash cams in the car, and we watched him cycling head down, riding straight into the back of the car. I really didn’t want to laugh at the time but it was hilarious! It reminded me of something from Jackass! How did you manage to persevere with the rest of your lesson? The rest of the lesson was fine, I was now super alert for every possible danger. The whole time I was driving past cyclists and hoping they wouldn’t fly into me. By the end of the lesson my instructor asked me if I wanted the video and he sent it to my phone, which was when I put it on Facebook. And that’s when it started to go viral? Yeah, when I woke up the next morning it had something like 50,000 views, and I thought it was hilarious. It was so weird! I think cyclists and drivers alike were sharing the video and we were up to 500,000. It got to the point where people were showing my Dad the video not knowing I was in the car! Have you ever had a chance to speak to the cyclist? No I haven’t, he’s never got in touch. I can imagine he’s really embarrassed. I hope he’s okay, I really do, I completely empathise with him. Do you think young drivers get a bad rep? I think young drivers on the whole are trying to concentrate as much as they can, they aren’t trying to race, they’re just trying to get it right and pass their test. There’s a very small minority of young drivers who let the side down, I remember when I was at school there were a few people who messed around but the vast majority just want to drive safely. How many lessons have you had now? I’m 10 lessons in, I’ve done all of my manoeuvres and the theory test needs to be booked, but I’ve been mainly focusing on just doing the basics of driving so far. My next lesson will be driving at higher speeds, so I’ll be getting to go at 60-70mph. Confident for a first time pass on the practical test then? My driving instructor has a really good record, but I’m not going to say anything, I’m just going to touch wood and hope for the best! Our expert team understand the misconceptions of young drivers and offer quality insurance and prices that reflect this. For information on Young Driver’s insurance, please get in touch with Think today. This entry was posted in Car Insurance, General Motor News and tagged Cyclist Accident, Cyclist vers Parked Car, Learner Drivers, Sefton Park Liverpool, Viral Youtube video on July 31, 2015 by admin. As more people start to see the benefit of Telematics, Think uncover the facts behind the black box being fitted in young drivers’ cars. Plenty of insurers are now encouraging young drivers to install black boxes in their cars to help monitor their driving performance. The technology is called telematics and it’s aim is to reduce the amount of accidents that young drivers are involved in during their first 12 months of driving, and beyond. Insurance premiums for young drivers are high because 1 in 5 have an accident within the first 12 months of passing their test. 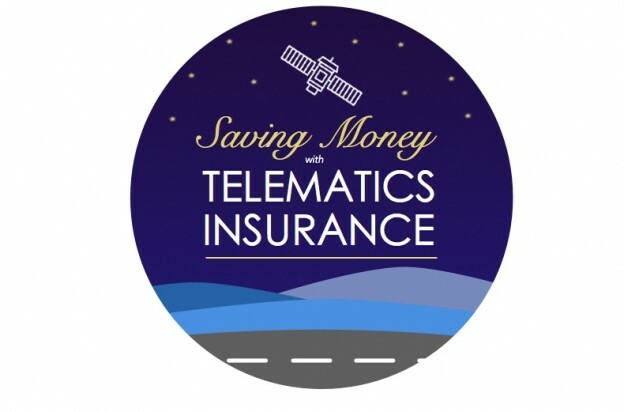 The alluring draw of telematics technology is the discount that insurance brokers are offering in exchange for their installation. Many reports show that drivers who purchase their insurance with a black box in place can get 25-30% discount off their policies, and save up to £1,000. Telematics gives young drivers a chance to prove they are responsible drivers, rather than punishing them with high premiums before they’ve even made an error. 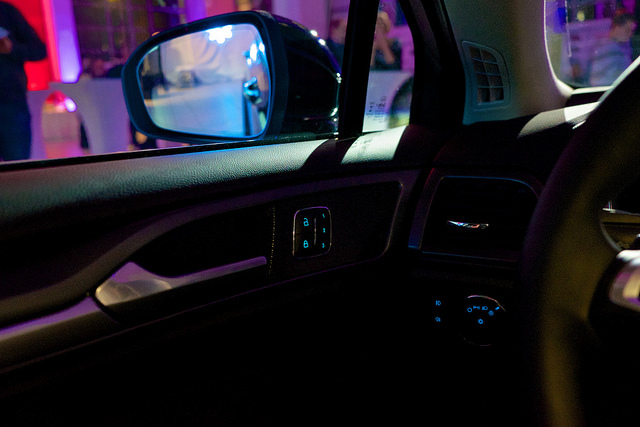 Some people may worry that their privacy is being invaded by the technology, and their every move recorded, but this isn’t the case, and in most instances only the information needed to score their driving ability is recorded such as the car’s speed, acceleration, braking, cornering and time of day the car is driven. The data essentially tells the insurance companies how their customer is driving. Those who drive more safely will score better; those that break the speed limit, accelerate aggressively and break sharply will receive lower scores. Depending upon which insurance broker or company you are with, will determine the impact of these scores; some offer discounts for high scores, while some charge penalties for low scores; some reward good drivers with incentives and prizes, while others can even penalise consistent low scores by cancelling your policy. We spoke to Michael Fowler, a young driver who in his first year of driving had telematics technology in place. 1/8 UK licence holders aged 25 or under. 1/3 road death victims are under 25. 18-year-old drivers are more than 3 times as likely to crash than 48-year-old drivers. Over 1/4 motor-related injury claims of over £500,000 involve under 25s. Source: Association of British Insurers (ABI) via BBC. While the driving performance statistics are against young people, telematics is a great and viable option for reducing their premiums and encouraging safer driving on the roads. To enquire about a black box telematics insurance policy, please get in touch with us here at Think Insurance. This entry was posted in Car Insurance, General Motor News, News and tagged ABI, black box, telematics, Think Young Drivers Insurance on July 29, 2015 by admin. As the DVLA ends the paper counterpart licence, fears arise around hiring a car this summer. The DVLA is scrapping the paper counterpart licence which accompanies the photo card licence, and are warning holidaymakers to obtain a special online code before going away and renting a vehicle. It is thought that this might cause some disruption to hire services. Paper licences currently hold the information of endorsements and bans that drivers receive, but when the new service is rolled out, they will no longer be required. The new service called, Share Driving Licence, will hold every driver’s endorsements and bans, it will be visible to rental companies after the Driver gives them the passcode, along with their licence. From June 8th, drivers will need to log on to the DVLA website and input their driving licence and national insurance number. They will then receive a one time only passcode that allows them to hire a car. Users then have 72 hours to hand over the code, after that they will have to request another one. If a driver is unable to produce an online code, the car hire firm will have to call the DVLA’s premium rate line, which charges up to £3 a minute, to check their driving history. Restriction on the phone line’s opening hours and the cost of the call, may cause massive delays for holidaymakers wanting to rent a vehicle. Many critics of the change over are worried that people and car hire companies are unaware of the rule change, though the DVLA insists that the changes have been widely publicised, and they are working closely with car hire companies to ensure “minimal disruption”. Travel and car industry experts suggest that drivers wanting to hire a vehicle abroad in the first few months of transition should take a pdf copy of their driving history and at the very least take their national insurance number with them. For information on Car Insurance or Travel Insurance, please get in touch with Think Insurance’s expert team today. This entry was posted in Car Insurance on May 18, 2015 by admin. The new digital method of taxing vehicles has caught many used car buyers unawares causing their newly purchased vehicles to be clamped. The old method of paper tax documents that sat in the window of your car has now ceased and switched to a digital document. Now when a vehicle is sold to a new owner the paper document is automatically cancelled. The new car owners must buy a new digital document even if the paper discs expiry date is several months away from expiry, and those that are ignorant to this information risk getting their new car clamped. Thousands of people have experienced the clamping fate since the new system was introduced in 2014 and have been charged over £800 to have their car returned. The fines cannot be appealed, meaning drivers have no option but to raise the money and pay to get their car back. Understandably, many of the drivers who were oblivious to the rules feel unfairly treated. Some people are calling the operation a scam for the DVLA to make money and believe they should have at least been warned that their vehicle was not taxed. The DVLA will receive millions of pounds more each year because of the double road tax payments from the vehicle’s buyers and sellers. Before the changes, clamping figures were about 5,000 vehicles a month, but the numbers in March this year were upwards of 8,500, which shows a 60% rise in clamping. DVLA officials told The Guardian newspaper that they had sent out letters to recent car buyers telling them of their untaxed cars, but for many their letters were too late and some drivers received the letters after their cars had been clamped. 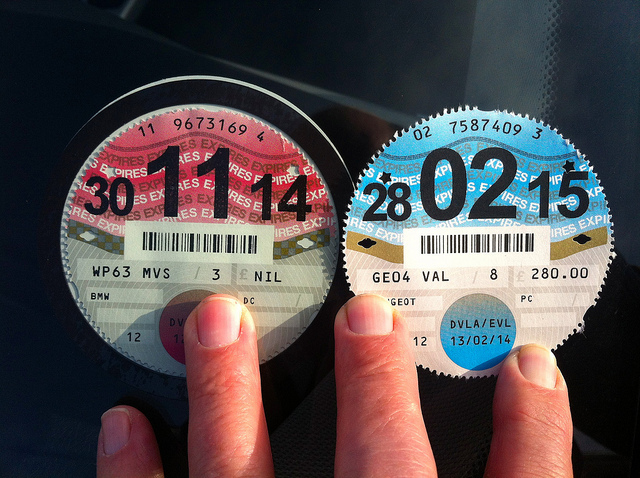 A spokesperson from the DVLA responded to the criticism, “The changes have been widely publicised and we write to every vehicle keeper to remind them of the new rules before the vehicle tax expires. For information on Car Insurance please get in touch with Think Insurance. This entry was posted in Car Insurance on May 13, 2015 by admin. A popular app that engages learner drivers and driving instructors has successfully achieved it’s 50,000th pass. Learning to drive can be one of the most stressful and costly experiences of our lives, making things that bit easier for new drivers is the UK’s most popular learner driver app, miDrive. The free app, available on IOS and Android platforms, helps users to improve their driving skills by using videos, blogs and lesson routes, preparing the students for life on the road. miDrive have found a real gap in the market, and have proved their is a need for a digital service for learner drivers. The app, that also puts the learners in touch with their database of over 3,000 qualified and verified instructors, have now achieved their 50,000th successful pass. 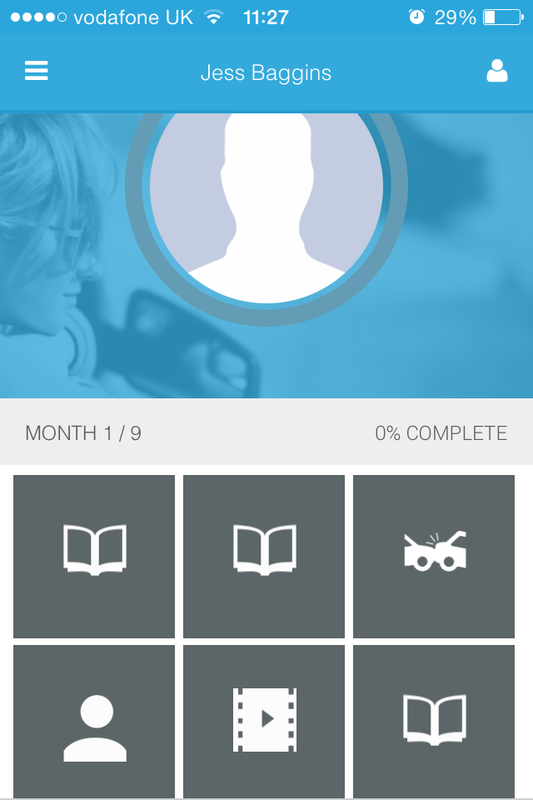 The app itself is smartly laid out, and asks the learner to set a goal of when they want to pass. Amongst all its helpful information, it also uses GPS so that learners can track their lesson back and help them learn their possible test journeys. 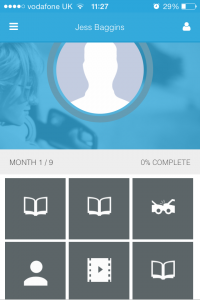 By completing activities within the app you unlock further activities, sort of like stages in a computer game, when you pass them you can move on to the higher levels. miDrive also offer a Theory Test which genuinely makes the whole experience of learning to drive a bit more fun. The Theory Test has an element of competition, you can test yourself, or play against other learner drivers. To download the app head here, for young drivers insurance please visit Think’s Young Driver’s page. This entry was posted in Car Insurance on April 24, 2015 by admin. Think Insurance is an independent insurance intermediary with over 30 years industry experience. This means as a client we can offer you the best impartial help and advice. We are 100% customer service orientated with a passion to earn your business and then retain it year after year. We offer a full range of policies from Motor Traders to Builders, from Taxi Drivers to Private Car and Home Insurance! Think Insurance is based in the West Midlands which gives us an ideal location to service the whole of the UK. Or Just Get in Touch! Think Insurance Services Limited is an independent intermediary / credit broker. We are permitted to arrange, advise on, deal as an agent of insurers, help with ongoing changes, introduce to an insurer/premium finance provider(s) and arrange lending facilities in respect of general insurance policies on behalf of our clients. Registered in England & Wales (No.06809003). Registered Address: Think Insurance Services Ltd, Suite 1, 1st Floor, 26 Newhall Street, Walsall, WS1 3DZ. Authorised and Regulated by the Financial Conduct Authority (FCA No. 499053).